Thanks, Mike! Here it is with some relief cuts in the corners. The bottom is flat which I think will be appropriate for this design. I also added a coat of epoxy. The coamings, windshield, and a couple of other details will be the same wood. Should make for a really nice contrast to painted topsides. The bottom of my dash is extra boring, I do not suggest straight across. I can’t figure out why I used white oak for the dash either. Oh crap, You and I were posting at the same time. Straight looks great and I’m so proud of mine is what I meant to say. Hee Hee. That's funny, Matt! You just need a 12" chrome grab handle on the passenger side to dress it up. Sitting in this Geronimo, there's so much freeboard. That dash you see in the picture is 8 inches tall in the middle and there's still plenty of legroom. I won't have a ton of gauges but plan to have a stereo down the road. There's room for a glovebox on the passenger side that will probably be added NEXT winter. I'm going to have to do only a minimum of detail in order to get it on the water this year. That's cool, as you guys always say, these boats are "never really done." Looking good Matt. Moving in the direction of functionality of detail I think is the right choice especially if the build starts to drag on. Unfortunately, not all detail can be left until later, but I too am trying to go this approach. 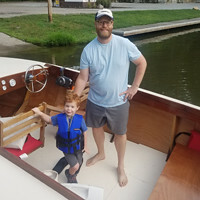 It will be cool to see photos (or video) of yours and Bob's Geronimos on the water. I guess I am a bit biased towards the hull plan! I made a pattern for the motorwell sides by hot gluing and stapling strips of cardboard together. It fits on both sides! Also, this folding rule is so much more useful than I ever thought it could be. The cardboard template worked perfectly. I think I will try routing out the second one with a pattern bit. Great job Matt, love seeing the creative use of old diaper boxes! Also, your continued posting has helped keep me going on my own build (little by little). So close to being ready to prime and paint the bottom and then FLIP! Thanks, Frasier, I'm sure we'd all like to see an update on your build! Agree Matt, I would love to see an update on Frasier's build as well. I ripped the off-color sapele for floor battens. The truck is my outfeed table now since I haven't built new sawhorses yet. Then I laminated them with some 3/8 ply to stiffen them up. I used titebond 3 here. We'll see how it holds up. I'm guessing for the life of the boat but who knows. Nice! No material waste there!